I often interrupt working on the computer with a quick game of Solitaire. Mindlessly moving cards has a mind clearing effect and actually helps me focus on what I’m doing, or at least, that’s what I tell myself. The last game did get me thinking about what programs I simply couldn’t live without, not counting Solitaire of course. I discounted school, or work, related applications like email, grade book, Office, or a web browser as ‘must have’ survival type software. With a cup of coffee, and another quick game, I concluded that there were, at minimum, two apps the loss of which would truly muddle the way I work. Evernote and Dropbox are two free web apps that allow me to collect, save, share, and later organize any matter of thoughts, notes, web pages, pictures, or anything really, from any computer or smart phone. I recommend both as a much better way to not ‘loose a bookmark’, forget a good idea, or wonder where you put that neat photo. So what are your ‘can’t live without’ applications? How do you work on the computer, and what do you use to make life easier? Sounds like a good self-reflection type question to me. 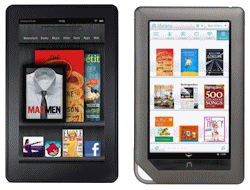 My daughter recently visited with her newly purchased ‘Nook’ tablet, plus a new Kindle ‘Fire’ she won at a charity raffle. I don’t have either one but now she has both. There must be something wrong with that. The only good part was it gave me an opportunity to compare both side-by-side and decide which was right for me. Both the Nook and the Fire share the same processor, same as the iPad 2, so not surprisingly the performance of both seemed much the same. The Nook trumped the Fire with double the memory and storage capacity. For me, that was impressive. For visual and in-your-hand appeal the Fire took honors. The glossy black won my heart. Barnes and Noble have in-store sales and service, which is something Amazon cannot match. Amazon has a staggering array of services, cloud storage, and app store, which is something the Nook cannot match, at least yet. My verdict; a very close call. While the Nook’s hardware was appealing to a gadget geek like me, I think I’ll stick with Amazon’s services and go with the Fire. Anyone have other thoughts or observations? How do you use, or see yourself using, an e-reader device? Another of our Kindergarten teachers has shared a new, and innovative, class management site called “Class DOJO“. ClassDojo enables the teacher to easily award and record points, achievements and rewards for behavior and performance in class in real-time, with just one click of your smartphone or laptop. ClassDojo provides instant visual notifications for your students (‘Well done Cindy-Lou Who! +1 for teamwork!’) with a whole host of game mechanics: think level-ups, badges and achievements to unlock, in-classroom games, avatars and leaderboards. We will be looking forward to future reports. ClassDojo will be free for teachers who are part of the beta test group. There are a limited number of places available in this group, so sign up early and be a part of it! One of our kindergarten teachers recently shared with the staff a quick, easy, and free web site for graph making called Kids’ Zone . The site is indeed an excellent resource to engage a math class needing a bit of tutoring on graphs and the information they can communicate. But the site has far deeper resources than just Kid’s Zone. The National Center for Education Statistics (NCES) is the primary federal entity for collecting and analyzing data related to education. The nations report card in reading and math are only two of the latest subjects. Need some information on the state of American Public Education? This is the place I would start. I stumbeled on this site when we first started the IPS Wiki. The site has multiple ideas on how to use a Wiki in the classroom. All are practical and readily doable. A ‘must read’ for any teacher looking for an idea to engage their students. But Wikis are not the only covered topic. Rubrics, free audio books, resources for graphic organizers, or vocabulary development all have excellent coverage. The list goes on and on. Check it out, you will be glad you did! One of our teachers recently acquired a digital camera, and asked for some ideas for its use to engage her students. She wanted her students to use the camera to illustrate creative writing stories, but simply putting pictures in a word document, or printing them out, seemed “old fashioned”. 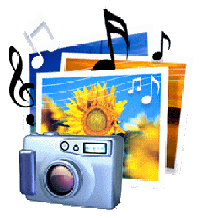 I suggested an often overlooked free application called Photo Story 3 for Windows. Photo Story creates slideshows with your digital photos. Stunning special effects can be added, titles, captions, soundtracks, or even the students own narration can be added. Small file sizes make it easy to send your photo stories in an e-mail, watch on a computer, smart phone, or embedded in a Wiki or web page. Photo Story has a table top flat learning curve that anyone can master. Easy, polished, and with certain student engagement, it’s a classroom “do-able”.